NASA's Orion Launch Abort System launched on its first test flight, Pad Abort 1, on May 6, 2010 at the White Sands Missile Range in New Mexico. Here, the escape system (left) has reoriented the Orion capsule mockup and is poised to release it after a successful launch abort. WASHINGTON -The U.S. House Science and Technology Committee has given NASA one week toflesh out cost and schedule estimates for a slimmed-down version of the OrionCrew Exploration Vehicle the agency has been directed to build to provideemergency crew escape for the International Space Station. 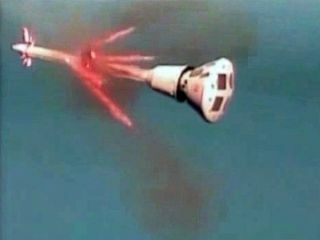 NASAspokesman Bob Jacobs said the agencyis working to give the committee the information it seeks, including howmuch it would cost to build the Orion lifeboat, how long it would take, andwhether the agency would modify Lockheed Martin's existing Orion contract orput the project out for bid. "Wewill work to provide the requested budgetary information as requested by theCommittee leadership," Jacobs said June 10. "There is an internalteam within Exploration Systems making the Orionassessments." The HouseScience and Technology Committee's request, made June 10 in a letter to NASAAdministrator Charles Bolden, comes as the oversight committee draftslegislation authorizing NASA programs and spending levels for at least the yearahead. The letter was signed by House Science and Technology Committee ChairmanBart Gordon (D-Tenn.), ranking member Ralph Hall (R-Texas) and Reps. GabrielleGiffords (D-Ariz.) and Pete Olson (R-Texas), the chairwoman and ranking member,respectively, of the space and aeronautics subcommittee. During a May26 hearing before the committee, Bolden testified that the Orionlifeboat NASA has been directed by President Barack Obama to build couldcost around $4.5 billion and take five years to complete. Gordon saidhe had been told internal NASA estimates put the price tag as high a $7billion, prompting Bolden to promise a refined estimate as part of a revised2011 budget request he said would be delivered to Congress imminently. In the June10 letter to Bolden, Gordon and his colleagues gave NASA until the close ofbusiness on June 16 to deliver the budget details the committee seeks. "As thecommittee prepares to move forward with an authorization for the agency, it isessential that we have the agency's justification for these significantprogrammatic and funding changes," the letter states. Gordon andhis colleagues also asked Bolden in the letter to provide the committee withthe "budgetary analysis and assumptions" behind NASA's plan to buildthe Orion lifeboat, extend space station operations through 2020, fosterdevelopment of commercialcrewed systems to get astronauts there and develop a heavy-lift rocketwhile also investing billion of dollars in technologies and robotic precursormissions meant to lead to a manned expedition to an asteroid in 2025. While NASAnow says it will try to meet the committee's June 16 deadline, Jacobs told Space News that producingclear cost and schedule estimates for a project like the Orion lifeboatnormally takes a couple months to complete.